Sainte Foy ski holidays, chalets, apartments, catered and self catered accommodation - a great place for mountain lovers, skiers and snowboarders. For useful ski information on Sainte Foy look at the Sainte Foy ski area overview. Nestled in the French Alps, close to the Italian border, at a height of 1550 metres, Ste Foy's stunning location gives breathtaking views of the valley below and the impressive Mont Pourri plus access to over 800 hectares of virgin snow right at your back door. Often referred to as the "Jewel in the Crown" of the French Alps, located just down the road some of worlds most famous resorts - Val d'Isere, Tignes and Les Arcs as well as La Rosiere from where you can ski into Italy! This central location gives you access to some of the best skiing the world has to offer. The village of Sainte Foy remains remarkably unspoilt and has preserved its authentic charm and local architecture. It boasts affordable lift passes and excellent traditional restaurants and bars. The ski area includes 35km of pistes and extensive off piste. 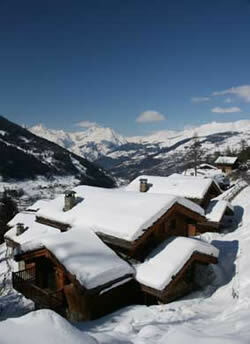 To search for ski holiday chalets try Chalets Direct Accommodation Search .